According to Herr Cook's observation, the inhabitants of New Guinea have something they set light to which burns up almost like gunpowder. They also put it into hollow staves, and from a distance you could believe they are shooting. But it does not produce so much as a bang. Presumably they are trying to imitate the Europeans. They have failed to realize its real purpose. Aphorism 27 in Notebook D (1773-1775), as translated by R.J. Hollingdale in Aphorisms (1990). Reprinted as The Waste Books (2000), 48. Analogy is a wonderful, useful and most important form of thinking, and biology is saturated with it. Nothing is worse than a horrible mass of undigested facts, and facts are indigestible unless there is some rhyme or reason to them. The physicist, with his facts, seeks reason; the biologist seeks something very much like rhyme, and rhyme is a kind of analogy.... This analogizing, this fine sweeping ability to see likenesses in the midst of differences is the great glory of biology, but biologists don't know it.... They have always been so fascinated and overawed by the superior prestige of exact physical science that they feel they have to imitate it.... In its central content, biology is not accurate thinking, but accurate observation and imaginative thinking, with great sweeping generalizations. In Science is a Sacred Cow (1950), 98-100. Bacon first taught the world the true method of the study of nature, and rescued science from that barbarism in which the followers of Aristotle, by a too servile imitation of their master. Children are to be guided to make a beginning in all the arts and sciences without interference with their spontaneity, the instinct of imitation being so used as to give them order without constraining them. In Friedrich Fröbel and Josephine Jarvis (trans. ), 'American Preface', The Education of Man (1885), vi. In The Passionate State of Mind (1955), 138. 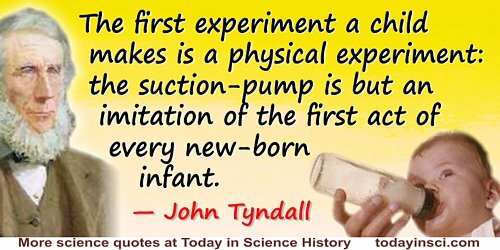 The first experiment a child makes is a physical experiment: the suction-pump is but an imitation of the first act of every new-born infant. Lecture 'On the Study of Physics', Royal Institution of Great Britain (Spring 1854). Collected in Fragments of Science for Unscientific People: A Series of Detached Essays, Lectures, and Reviews (1892), Vol. 1, 283. The magnetic force is animate, or imitates a soul; in many respects it surpasses the human soul while it is united to an organic body. In De Magnete. Cited in Gerrit L. Verschuur, Hidden Attraction (1996), 31. There is, I think, no more wonderful and illuminating spectacle than that of an osmotic growth,—a crude lump of brute inanimate matter germinating before our very eyes, putting forth bud and stem and root and branch and leaf and fruit, with no stimulus from germ or seed, without even the presence of organic matter. For these mineral growths are not mere crystallizations as many suppose … They imitate the forms, the colour, the texture, and even the microscopical structure of organic growth so closely as to deceive the very elect. In the Preface of his translation of Stéphane Leduc, The Mechanism of Life (1911), vii-viii. Aphorisms (1775-1779) trans. Franz H. Mautner and Henry Hatfield. In Fred R. Shapiro and Joseph Epstein, The Yale Book of Quotations (2006), 459:1. Voluntary attention is … a habit, an imitation of natural attention, which … serves, at the same time, as its point of departure and point of support. … Attention … creates nothing; and if the brain be sterile, if the associations are poor, it will act its part in vain. We quote not only books and proverbs, but arts, sciences, religion, customs and laws; nay, we quote temples and houses, tables and chairs by imitation. Without the suitable conditions life could not exist. But both life and its conditions set forth the operations of inscrutable Power. We know not its origin; we know not its end. And the presumption, if not the degradation, rests with those who place upon the throne of the universe a magnified image of themselves, and make its doings a mere colossal imitation of their own. In Forms of Water in Clouds and Rivers, Ice and Glaciers (1872), 125.